I've long admired my favorite cartoon characters for their perfectly organized, perfectly uniform closets. Think Doug Funnie and 10 neat green vests hanging comfortably side by side, no doubt yearning to be closer to Patti Mayonnaise's polka-dot sweaters. My closet looks more like something a hysterical Angelica Pickles tore through in the middle of a tantrum—wire hangers akimbo, an aggravated neon green dress I haven't worn in years shoved in beside a hopeful rainbow of skirts that I believe might one day fit again (as if). There's no method to my madness, but there is a potential solution: Throw everything out and just wear my favorite Uniqlo loungewear forevermore. I'm serious. I'm a big Uniqlo fan. I tend to dress in poles—in basic colors like black, navy, and white and jeans for day-to-day and sparkles and neon if I need to get fancy. I get a lot of my basics from the Japanese superstore. In an effort to make my wardrobe more like Doug and less like Angelica, I've been trying to pare it down and only purchase pieces I need, want, and love. I recently convinced myself I needed sophisticated sweats that could work for the office (on Fridays) and for Sunday errands because comfort is important to me, but so is maintaining a somewhat elevated appearance that wouldn't alarm my grandmother. A clandestine desk selfie to show off my favorite new sweatshirt. 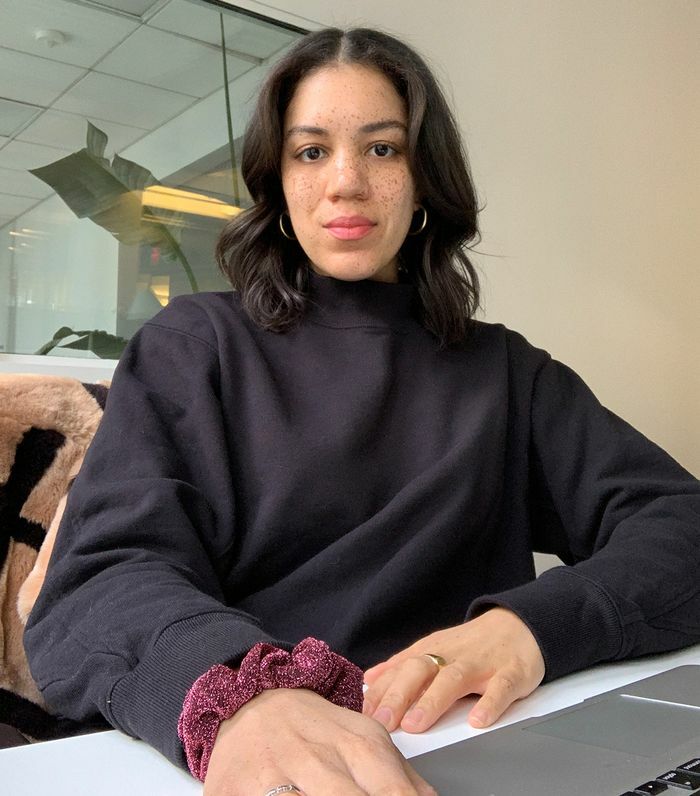 The first piece to catch my eye was a mock-neck sweatshirt from Uniqlo U, the company's line of "progressive essentials" that Christophe Lemaire designs in a Paris atelier. I loved the thicker French terry fabric, which lent a bit more sophistication to the piece. So too did its seams, which traveled diagonally down the body and the sleeves, in contrast to other, less interesting sweatshirts and their uninspired, straight seams. To complete my sophisticated sweat set, I also purchased a pair of Uniqlo joggers whose tapered cuffs seemed fancier than the straight-leg or (heaven forbid) scrunched elastic sweatpants I wore in high school and college. Since outfitting myself in this makeshift loungewear set—I got both items in black, size medium—I've found myself wearing it all the time. The all-black look elevates the set even more, and I plan on packing it for an upcoming trip to Paris and wearing it underneath a navy trench coat for my morning croissant excursions. I'm not throwing away the rest of my wardrobe just yet, but I am relishing the fact that my favorite budget-friendly loungewear is so versatile I've basically made it my new uniform. I think Doug Funnie would approve. Shop my favorite Uniqlo sweats below along with some other faves from the brand and more stylish sweats after that. 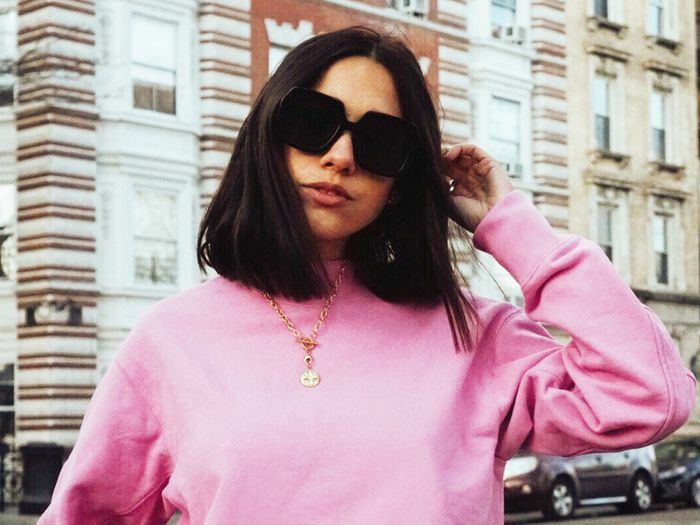 Fashion blogger Frances Estrada is also a big fan of this sweatshirt. I'm probably going to order these in all the other colorways. This is technically in the men's section, but I'm digging the way these girls styled the shirt tucked into mid-rise jeans. Another elevated Uniqlo U item that deserves a space in everyone's closet. I swear this was a Friday. I'll be pairing this with my Levi's Ribcage jeans. I bought this sophisticated packable puffer for that trip to Paris I mentioned. I think French designer Inès would approve. It doesn't get much better than an It designer at an affordable price point. In case you missed it, beige is back. My fellow editor Virginia Yapp noticed daisies making a comeback, and now I'm seeing them everywhere too. What's an appropriate number of black hoodies to own? The limit does not exist. Wear lavender with another Easter egg shade for a trend-forward color combination. This fleece is made from plastic bottles that are melted down and turned into thread. The matching sweatpants are basically a necessity. This socially conscious brand shares 90% of its profits—hence the name—with charitable causes and those who make its clothes. A one-and-done situation that's calling my name. Next up, here's what you need when your mini bag is too small for, well, much of anything.